If you don't have any little children to blame for an inadvertent or misguided app, book, or music purchase from Apple, you might still have a fighting chance. Apple has a very strict return policy, specifically stating that all sales and rentals of products are final for purchases made in the iTunes Store, Mac App Store, App Store, and iBookstore. But if you play it carefully and do a little digging, a return and full refund may still be possible. Accidentally downloaded the wrong application? Maybe you just didn't like the download. Maybe you meant to download the standard show instead of HD. Maybe you bought an iPad app for your iPhone. Whatever the reason—you have to act quickly. The faster you work, the better your chances are for getting your money back. There's a couple of ways you can go about this. What you have to do locate the email you receive when you purchase any item; its emailed to whatever address you have linked to your Apple account. Once you find that email, look for the report a problem link and click on it. You'll be directed to iTunes where you'll need to sign in. Then you'll be directed to your purchase history from that period. Hit the report a problem link next to the appropriate download and you'll then see a drop-down menu where you can select your reasoning for the complaint. Remember that Apple has the right to deny your claim for a refund no matter how legitimate you think your argument is, so it helps to be as cordial as possible. Throw in a "Have a splendid day!" and you should be golden. Deleted your email receipt? 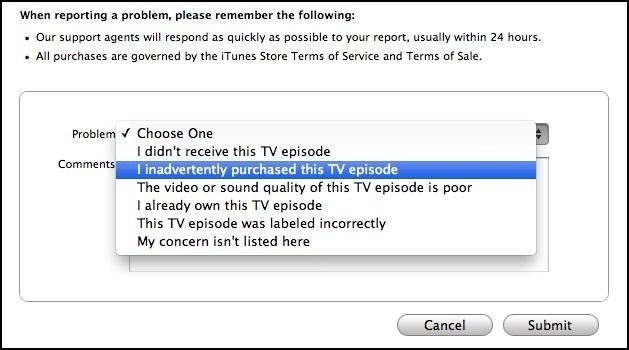 You can still access the above drop-down menu by viewing your purchase history in iTunes. Just click on your email address in iTunes to view your account. Enter your password if necessary, then click on see all in the purchase history section. Then just find the download in question and click on the little arrow to the left of it, which will bring you to the invoice period, just as above. If you don't see the report a problem links next to your download in question, you might have to click on the big report a problem button. This will bring up the report a problem links next to each download, then hit the appropriate one to access the drop-down menu and send your refund request. Now, the above doesn't work for everything. As you can probably tell, you can view items purchased on your device, through iTunes, or via the Mac App Store all in your iTunes purchase history. But there are some items that will not bring up the easy drop-down menu. 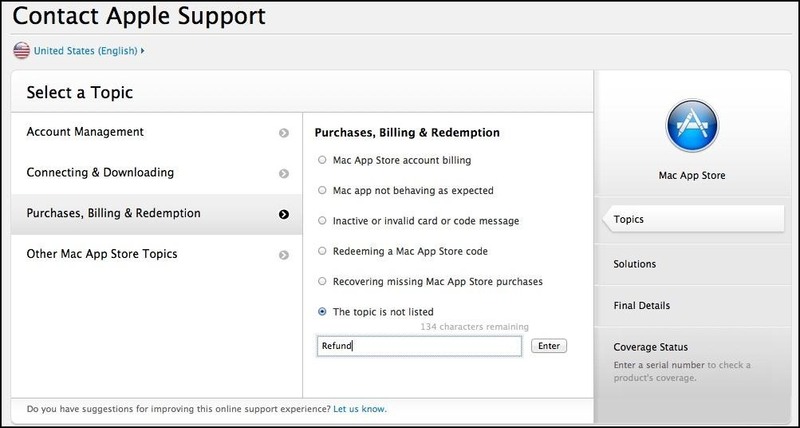 If it's a purchase from the Mac App Store, you will instead be directed to the Mac App Store Support page. From there, you can contact Customer Support through the appropriate links. But they have nothing concerning refunds, so you'll have to Purchases, Billing & Redemption and select the topic is not listed to get to the email option. If you're ordered a season pass for a TV show from iTunes, you'll probably be redirected to the same Contact Apple Support page, where you'll need to do the same as above. You can also just click here to go directly to iTunes support or click here for Mac App Store inquires. It takes around 24 to 48 hours to get a response, so you will know your fate rather quickly. If they turn you down, then you're pretty much out of luck. Wish I would've known this the other night when I was waiting 5 hours for the HD movie I accidentally bought to download! Yeah, I have the problem all of the time. HD might look better, but not enough to justify the hard drive space. I've asked a couple times before for refunds, and they've always given them to me.